Leaves dance above you in the crisp ocean breeze, as you choose to settle down under this palm tree in particular. The coral-colored sand slowly sifts between your toes and you unfurl your beach towel in the partial shade. A light wind sends ripples through the terrycloth as it lands on peaks of pink grains and prepares for your arrival. You lie down, close your eyes, and listen to the waves that whispered this island’s name in your dreams. Finally, you’re here. Serenity consumes you as you pay silent tribute to the volcanoes that made this paradise possible. And in your soul you know it’s true; this is the exact place you’re meant to be at this moment. Welcome to Bermuda. 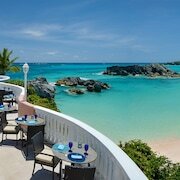 Wondering where to visit in Bermuda? 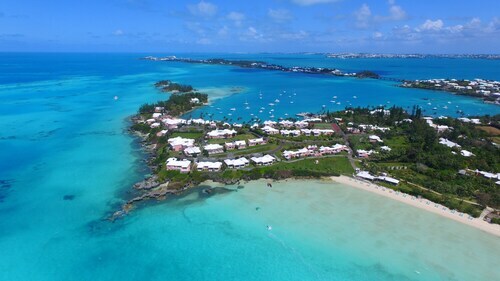 It’s no surprise that Horseshoe Bay Beach, Tobacco Bay Beach, and the dozens of other beaches here are among the top destinations on Bermuda, but there’s a lot to see and do off the sand as well. With more than 200 types of fish and 300 species of creatures from around the island, the Bermuda Aquarium, Museum & Zoo is an incredible attraction that shouldn’t be missed. And another popular spot is Dolphin Quest in the Royal Naval Dockyard. If you want an up-close encounter with these friends from the sea, consider this aquatic center a can’t-miss. Should I rent a car in Bermuda? While having a rental car on vacation can be nice, temporary vehicles simply aren’t offered on the islands of Bermuda. But who really needs one, anyway? When you’re already in one of the best places on the planet, why go anywhere else? So without the worry of a rental car, how can you get around? Bermudian buses can take you from point A to B, but luggage isn’t allowed onboard. As far as getting from the airport to any of the all-inclusive hotels in Bermuda, you’ll want to catch a cab or shuttle to wherever it is you’re staying. And since many of the most popular tourism districts are easily walkable, your feet should be able to take you everywhere you’d like to go. 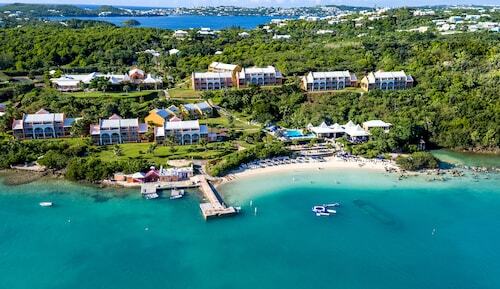 If you’re ready, wise wanderer, to escape your everyday cares and find yourself in a dreamland unlike anywhere else, count on Travelocity to help you land the best deals on rooms at Rosewood Tucker's Point or any of the other best all-inclusive hotels in Bermuda. Even though this isn’t all that far from mainland America, you’ll certainly feel a world away. And our intuitive tools will help you make the most of your stay here. So book your trip today and you could be in paradise tomorrow. The view was beautiful, the room was very nice and clean, the service was with a smile, we were close to everything the restaurant, the beach, the pool, the water sports, the bus stop the locals are helpful and will to tell you how to get to where you need to go. They all speak english. Very expensive in Bermuda but we had a great vacation. The property was amazing. The people were all wonderful, friendly and accommodating. Bermuda is a lovely, clean, and safe island. This property has direct access to beaches and transportation, as well as within walking to some local groceries and restaurants. The only complain is that it is very expensive to eat and drink here. The prices of food and cocktails was very high. However, it was still comparable to other resort areas and up scale restaurants. It's a lovely hotel, but visitors with experience at Bermuda's cottage colonies might appreciate it a bit more than others. It's quiet, relaxing and private. The staff are all friendly, helpful and kind. It is a distance from the airport, but it's never hard finding a friendly cab driver to take you there. The cabs have a standard rate and since it's Bermuda, no one is trying to rip you off, but it's not cheap. It's an island, and gas is expensive. The rooms are generously sized, but as with any cottage colony, there may be variances in decor, layout and how recently renovated they are. But if you have any problems, just let the front desk staff know and it will be remedied quickly if possible. The free "continental" breakfast is not a continental breakfast. It's a huge spread with attentive table service every morning. Omelettes to order, fruit, salmon, pancakes, yogurt, 6 different juices. Cons: 1. depending on the tides and how deep the water is, on some weekends the peaceful beach gets infiltrated by obnoxious boat owners who pay a fee to be allowed to eat at one of the restaurants. And when they're done, they get drinks to go and walk out to their boats and hang out there for hours on end. Loudly. 2. Either bring actual books or download shows in advance on a laptop, because if their wi-fi unexpectedly goes down, as it recently did for 3 full days of my trip, it will be painful. They only have about 20 tv channels, and one of them ONLY shows soccer games. 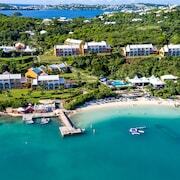 A Charming Bermuda Gem ?